The outstanding Midwifery license in the State of Virginia may soon to be an option! It is $10 for the application. If you wish to make the plate a vanity (personalized) plate, then send the additional amount with the application (an additional $10 = $20 total). Send a check or money order made out to: Jeni Rector. Jeni is a Licensed Midwife in Hampton Roads, VA. She is also on the Coordinating Committee of the Commonwealth Midwives Alliance (http://www.commonwealthmdiwives.org/). 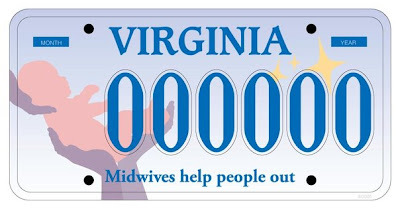 If you are on Facebook: Become a fan of the VA Midwifery License Plate and tell your birth-advocate friends.